Laser X is an affordable option for kids and adults alike. Laser X includes 2 guns and 2 vest and can be easily paired with other Laser X products to increase the amount of players. With it's 200 foot range this can be played indoors as well as outdoors with good results. After many years of patience and anticipation, 2016 saw the birth of a new home laser tag system: Laser X.
It’s been quite some time since we’ve seen a brand new and decent home laser tag gun set introduced on the market. 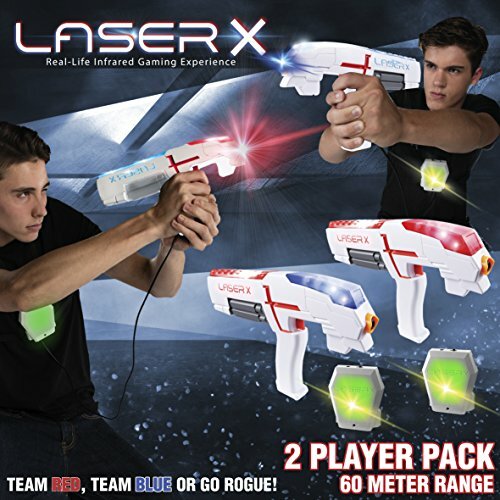 Some of the most popular home laser tag sets, such as Call of Life, Nerf Phoenix LTX and WowWee Light Strike, have been around for ages, so Laser X certainly has come at the right time. 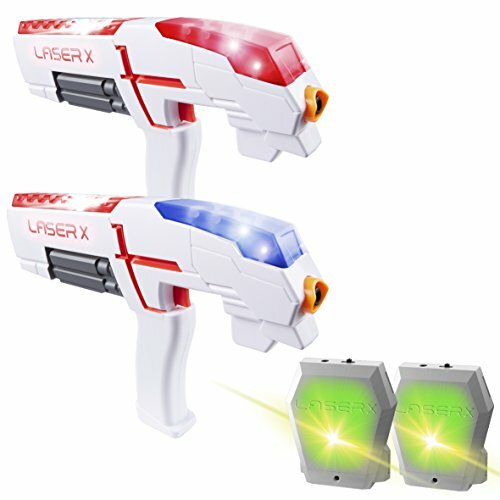 Will the Laser X Laser Gaming System be able to compete with these established home laser tag guns? Let’s have a closer look at the main features of the Laser X laser tag system. The first thing you’ll notice with the Laser X guns is their somewhat awkward shape, with the back of the gun a bit bigger than the front part. It’s not exactly what you would expect a gun to look like, but it’s not a major issue. The overall grip is good which is most important. The sound and light effects of the Laser X are good enough. It even has a voice giving you tips and feedback about how you’re playing and your status. It also strongly encourages you to keep moving around. A cool feature is that you can actually plug in a pair of headphones so you can hear everything right inside your ears. This is particularly useful if you don’t want your opponents to hear the feedback you’re getting, or if you don’t want your enemies to be able to actually find you when you’re trying to hide. We’ve seen it before with some home laser tag guns that there’s just too much emphasis on sound effects to a point where it gets annoying. But the Laser X system seems to have got it right. The best way to play a laser tag battle with Laser X? Indoors with the lights off! The light effects of the guns and target sensors will make it super exciting. The Laser X set comes packaged with either one or two guns, but no matter how many guns you buy, they will all work together nicely. Overall the team play concept works really well and prevents a laser tag battle from turning into one big game of chaos. While most home laser tag guns don’t require external targets such as vests to be carried around, Laser X does need you to wear a target vest, or harness, around your neck and shoulders. The one-size-fits-all vest can be easily strapped on and it’s by no means heavy or annoying, but some may prefer the laser tag gun to be the actual target. The vest is attached to your gun with a connecting cable. One benefit of wearing vests is that the target changes color from green to yellow/red when hit so it’s clearly visible for your enemies when they’ve scored a point. The vest only has a target at the front. A target at the back would’ve been nice, just like in most professional laser tag arenas. Once you’ve been hit 8 times, you’re out of the battle. You can get around this by not getting hit for at least one minute and you get one hit back. In other words, if you’re on 7 hits and about to get eliminated, go hiding for a minute and your balance drops back to 6. The advertised range is 200ft which perhaps sounds too good to be true. We’ve tried this outside and feel had some issues however others have reported it to be obtainable. Maybe, if all conditions were perfect with zero wind and no obstacles, you could reach that distance. But who needs a 200ft range with a home laser tag battle anyway? One Laser X gun requires 3 AAA batteries which are not included. Yes, that’s quite a lot of batteries (6 for a set of two Laser X guns), but not exceptional for home laser tag guns. Get a set of AAA batteries here (or rechargeable ones here). We like the Laser X laser gaming system and it’s hit the market at the right time. The guns feel reasonably robust (unlike other similarly priced home laser tag guns), they’re easy to use and they have a good grip. The vest with target sensor may be a drawback for some but it didn’t bother us at all. In fact, it adds value in a way, although we would have liked the vests to have a target at the back as well. The sound and light effects are pretty decent, not too much so that it doesn’t get annoying. The shape of the gun is a bit different from other home laser tag guns and may not be for everyone, but this is a matter of personal preference. What’s also worth mentioning is that the lasers are in fact not real lasers but infrared beams, so no need to worry about eyes getting damaged.